Identification is one exercise that takes place every day and everywhere in the world. This is actually the reason why we have birth certificates (in some traditional communities in Africa children are given tribal or family facial marks for identification), institutional, organisational and/or national identity cards, international passports, access codes, thumb prints and so on. All these are simply put in place in order to give information about us or identify who we are! It is a very basic instinct or desire in every human being to KNOW about certain things and persons. This desire to know is more avid when the person or thing in question has some special qualities. If we direct the attention to public figures we discover that people imagine and say a lot of things about them in a bid to understand who they are. I once sat close to two young men in a flight and they were having a conversation about one Nigerian actor who was featured in a popular Nigerian blog and who happens to be my cousin. One of them claimed to know the young man very well from his family and the other asked him where the actor comes from (that is the town) and he mentioned a town so unconnected with the actor and which happened to be the story-teller’s own town. The young man went on to tell his listener some fascinating stories about the actor’s family and other things that indicated familiarity. At a time I could not bear the misguided identity the young man was giving about my cousin, so I politely begged to interrupt and respectfully corrected the young man by first introducing myself as the actor’s cousin and redirecting the faulty descriptions one of which was that the actor’s father died when he was a kid though the man is still alive. At first the story-teller wanted to argue with me but when I showed him some pictures in my electronic devise he calmed down, though shamefully! Today in the gospel reading (Luke 9:18-24) we have an episode that is connected with the real identity of Jesus Christ. We are told that our Lord was praying quietly alone when the disciples came to him. Well praying was characteristic of our Lord Jesus Christ while on earth. He went into the wilderness to pray and fast for forty days and nights after his baptism (Matt.4:1-2) before choosing the apostles he took time to pray (Luke 6:12ff) he left Simon Peter’s house very early in the morning to pray (Mark.1:35) after the miracle of the loaves he went to pray privately (Matt.14:23),the disciples saw him praying and asked to be taught how to pray (Luke 11:1), he went up to mount Tabor with three of the apostles to pray (Matt.17:1-7),and before his arrest he was praying in the garden of Gethsemane (Matt.26:26). We are not told of the content of his prayer in the gospel passage nor what was going on among the disciples. From similar encounters we can imagine that among themselves the disciples would have been confused about the identity of our Lord Jesus Christ. Many people could also have been coming to them with arguments concerning the real identity of Jesus Christ. This is most likely the case because before this time Jesus had performed many miracles and given great messages in quick succession: healing the man with withered hand (Matt.6:6ff), preaching the beatitudes, love of enemies, judging others, bearing good fruits, and building on solid rock (Luke 6:20-49), healing of the Centurion’s servant (Luke 7:1-10), raising the son of the widow of Nain (Luke 7:11-16), forgiving the sinful woman (Luke 7:36ff), calming the storm, healing the man with demons, curing the woman with the issue of blood and raising the daughter of Jarius (Luke 8:22-55). The question Jesus asked: “who do people say I am” was not an accidental question. First our Lord knew what was going on among them the same way he knew when they were arguing about who was the greatest among them (Mark 9:33). The question could have come to them as a surprise but it was a lot safer because it had to do with what people were saying. Jesus was at this point, if you like at the middle of his ministry, trying to take stock as to the conceptions in the minds of the people about him so far before moving ahead. From the answers our Lord Jesus Christ got we can see that people were accessing the identity of Jesus Christ not on the basis of WHO he is really but on the basis of WHAT he had been doing. It is wrong to reduce knowledge about Jesus Christ based on mere miracles which he even said we could do even more (John 14:12). The answers showed that the people were describing Jesus by relating what he had been doing and saying with those of the prophets. That was not bad though Jesus Christ is neither John the Baptist, Elijah nor any of the prophets (old or new). Often we make the mistake of giving answer to “What” rather than “Who”. There is a difference between WHO a person is and WHAT a person is. “WHO” has a lot to do with essential quality while “WHAT” is merely functional quality that is what a person can do. It is like introducing someone as my doctor. This means that if there is no illness or health issue the person becomes irrelevant. 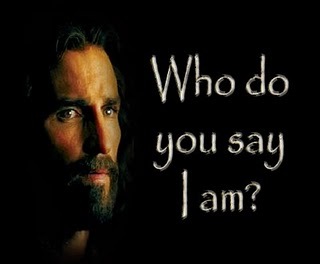 The question became more interesting when Jesus turned it to the apostles: “you who do you say I am”. From a deeper analysis we can see that the answer is in the question. “I am” is the name of God if we trace it from the encounter of Moses with God in Exodus (3:14) where God indicated that His name is I AM. During the dialogue between Jesus Christ and the Jews we also heard him say “before Abraham was I am” (John 8:58). We are also conversant with the “I AM” statements of Jesus Christ I AM THE: WAY, TRUTH, LIFE, LIVING WATER,TRUE VINE, GOOD SHEPHERD etc. In essence Jesus was asking them who do you say God the Son is? Peter’s declaration was very apt and complete: “you are the Christ of God”. He actually said you are the Messiah that is the Anointed one. Now this answer is all inclusive. If Peter had said you are the healer of the sick or the multiplier of bread it would amount to limiting the scope and work of Jesus Christ and his mission on earth. But when he called him Christ of God he opened up a limitless platform for the Messiah who is Anointed to be everything for us. What followed after Peter’s response is also very instructive. Our Lord warned them not to tell anyone about who he is and went further to indicate the fate of the Christ which includes passion, death and resurrection. The question any attentive mind would ask is “why did Jesus ask them to keep his identity hidden?” This issue had troubled a lot of bible scholars and for many it could be referred to as the messianic secret. Going by the answers the disciples gave about who Jesus Christ is, one discovers that not even a single idea came closer to mentioning that he is the messiah though there had been public announcements about him in the preaching of John and during his baptism; but their minds were still blinded to the plans and portends of God. That was why in the next chapter of Luke (10:21-22) our Lord filled with the Holy Spirit thanked God for hiding THESE THINGS from the rich and learned but revealing them to mere children. Next the passion and death of the messiah was destined to take place at certain time after all that had been said in the Old Testament about him had been fulfilled. To this end if the disciples would go about saying that Jesus is the messiah there will be conflict in the divine programme and due process. Finally in the gospel of John (12:23) our Lord declared: “the hour has come for the son of man to be glorified?” Hence there is a due season for the Messiah to be made manifest and declared among all nations. The question our Lord Jesus Christ asked the disciples still remains relevant to us today: “WHO DO YOU SAY THE SON OF MAN IS?” The answer we give to this question would determine our values, lifestyles and eternal destiny. · For some people Jesus is their refuge in TIMES OF TROUBLE (when there is no trouble Jesus Christ is not needed). · For some people Jesus Christ is merely a shield and protection against their enemies (without enemies, Jesus Christ is irrelevant). · For some people Jesus Christ is their guide when they are travelling (by the time they arrive safely Jesus is forgotten only to be remembered on another journey). · For some people Jesus Christ is the key for success in exams (when exams are over Jesus Christ is locked up in the bookshelf until the next exams). · For some people Jesus Christ is their PROVIDER (when the provision comes (employment, child, husband, wife, contract,etc) Jesus Christ becomes a stranger until another time). What I am out to establish here is that even in our own time and day most people are still ignorant of whom Jesus Christ is; they only have an idea of WHAT he can do and could only call on him like someone will call firemen to confront a fire incidence and go until another incidence occurs. The prophecy of Hosea (4:6) had it that my people perish for lack of knowledge. We reduce Jesus Christ to a small section of our life while he can be everything for us. If we can understand him as the Christ of God (the Messiah) then we have all we need in life here and hereafter. Fulton J. Sheen would instruct us to understand and appreciate the difference between Christ of faith and the historical Jesus. To understand who Jesus Christ is we must be ready to do so by accepting him fully by faith not because he can provide for us or heal us but on account of the fact that we cannot do without him and he is all we need! Have a blissful week ahead. ← WHO IS THE WORST SINNER? : HOMILY FOR THE 11TH SUNDAY IN ORDINARY TIME: YEAR C. Rev. Fr. Boniface Nkem Anusiem PhD. Quest for true identity should concern everybody not only our Lord, esp. now that identity crisis is the talk of the day. So, our Lord, as an examplary teacher and leader has left us with another example we should all follow. Discover your identity, discover your true self; live out your true self and your true identity is shown: A CHRISTIAN, A CHILD OF GOD.